How complex is people’s thinking? The percentages, of course, don’t add up to 100% and there is no breakdown of percentage to continents, cultures or societies. Cowan (Chris Cowan & Nastasha Todorovic, 2006b) has admitted that the figures were a (very!) rough interpretation/extrapolation of various data sets (including United Nations data) while Beck has never commented (for public consumption) on the estimates. Nonetheless, in general it supported the notion that the bulk of the population – the Western population, at least – were not significantly beyond a BLUE (Kohlberg) or BLUE/orange (Loevinger) way of thinking. Further support for this notion came from research using Kohlberg’s concepts. Using what effectively was a 9-stage model incorporating 3 sub-stages, Lawrence Walker, Brian De Vries & Shelley Trevethan (1987) found general agreement with Kohlberg. They interviewed 40 boys and 40 girls of various ages. 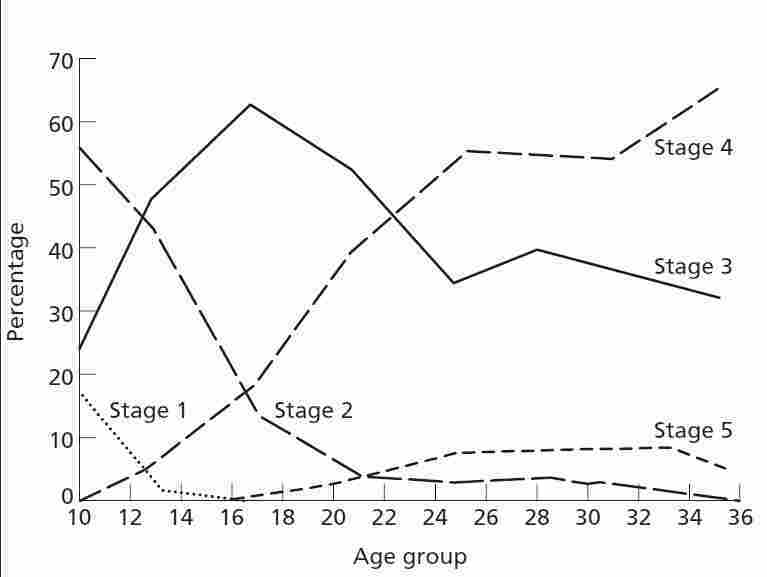 The majority of those aged 6 were between Stages 1 (PURPLE/red) and 2 (RED); at age 12 60% were between Stages 2 and 3 (red/BLUE); by age 15 the majority were at Stage 3. A further sample of adults was tested (average age: 40). The majority were between Stages 3 and 4 (BLUE), with 3% between stages 4 and 5 (green/YELLOW). When Walker (1989) retested the child participants 2 years later, 6% had moved down half a stage, 22% had moved up and none had skipped a stage. In 1983 Anne Colby et al reported on Kohlberg’s (1963) original 1958 group of 72 boys – see: Stages of Moral Development – having tested them 6 times at 3-yearly intervals in the 20-year interval. The results are graphed above. At age 10 the boys displayed mainly Stage 2 moral reasoning, with some examples of Stages 1 and 3. By the age of 22 no one used Stage 1 reasoning and Stages 3 and 4 were predominant. By the age of 36 – at which point the study terminated – there was only marginal evidence of Stage 5 reasoning (around 5%). In 1976 James Shaver & William Strong also raised the question of whether most people develop beyond Stage 4. In Integrated SocioPsychology terms, with Kohlberg’s stages seen as the outputs of vMEMES processing moral issues, then it would be expected that there would be a developmental hierarchy in the emergence of moral reasoning as people’s life conditions become more complex. However, if the life conditions do not require it, it is unlikely that more complex ways of reasoning would emerge. This may explain the relatively low level of emergence of higher vMEMES in the periods Kohlberg was conducting his tests. In the West, though, there has been a dramatically-accelerated pace of technological development over the past 30 years and, with it, a much-increased complexity of modern living, In such circumstances it might not be unreasonable to assume there are now, in fact, more people thinking in the higher vMEMES – even 2nd Tier…. Some evidence for this comes from Alan Tonkin (Alan Tonkin & Don Beck, 2003), extrapolating from data collected via his Global Values Network website. 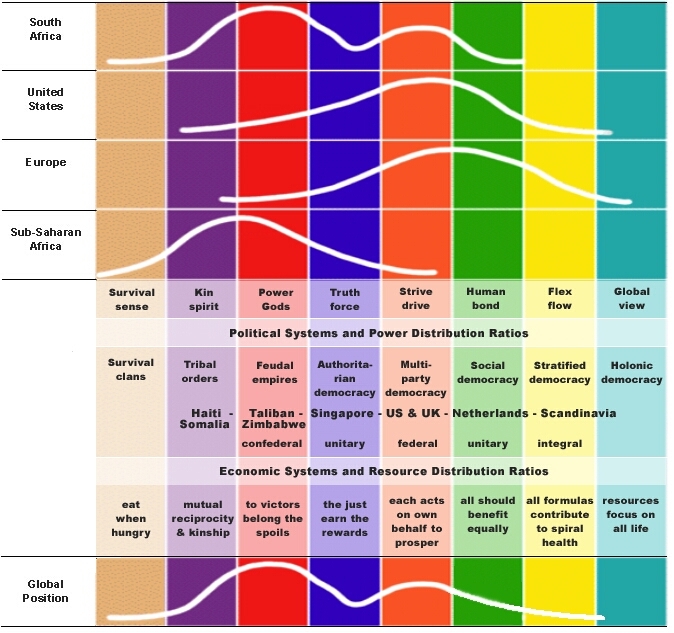 He has charted patterns of vMEME dominance in the US, Europe, South Africa and ‘Black Africa’ as shown below. There is more ORANGE and GREEN in Europe and the US than in Beck & Cowan’s original estimate. There appears to be more YELLOW and even TURQUOISE. However, in ‘Black Africa’, where life conditions are generally less complex, the bulk of the population’s thinking is still in PURPLE and RED. The vast majority of responses Tonkin collected were still very definitely 1st Tier. So it can be argued that increased complexity of living in the West has resulted in more access of higher vMEMES but still relatively little access to 2nd Tier thinking. Considering the use to which the Gravesian approach has been put and the obvious criticality of motivation to human thought and behaviour, frustratingly there has been relatively little academic research into the concept of vMEMES. Beck (2002a) refers to a cross-cultural application in that during 1999 John Peterson at the Arlington Institute conducted around 10,000 assessments across several different cultures and found “no significant variations” from what would be expected, indicating both reliability of the method and internal validity across cultures. A key problem in investigating the Gravesian model is that of falsifiability. According to the great philosopher of science and champion of the Hypothetico-Deductive approach, Karl Popper (1969), for a theory to be scientific it must be potentially falsifiable – ie: it is understood the research might provide evidence against the theory. (This is the reason researchers usually propose a null hypothesis for their studies.) A thinking systems approach such as that of Graves is difficult to falsify. Eg: if someone doesn’t respond to the life conditions as the theory predicts, there is no way of knowing if that provides evidence against the theory or the individual perceived the life conditions differently and, therefore, a different vMEME or vMEME harmonic was in play. Reently a group of German neuroscientists have found at least a partial way around the issue of falsifiability. In an academic cluster led by Svenja Caspers & Marc Lucas and centred on the University of Cologne, they have been using fMRI scans to look at how the neural physiology of participants changes when they make values choices. In this research they have used Graves’ and Loevinger’s original materials. The results strongly support a biological distinction between the ‘warm’ and ‘cool’ ways of thinking; they also suggest gradations in complexity of ‘warm’ and ‘cool’ thinking – though the researchers point out the latter results are not statistically significant. See: A Biological Basis for vMEMES…? If the Gravesian model is under-investigated – as is Loevinger’s – then the corresponding models of Maslow and Kohlberg have been much researched. Similarly the Stages of Moral Development have been attacked by the likes of William Crain (1985) as not being culturally neutral. However, Kohlberg himself (1969) had carried out studies in Britain, Mexico, Taiwan, Turkey and Yucatan and found that the order of stages was consistent across cultures, though development tended to be slower in non-industrialised countries. Lawrence Kohlberg & Anne Colby (1987) report that longitudinal studies in Turkey and Israel showed the same thing: consistent order of stages but different developmental paces. Kohlberg’s (1971) explanation was to say that, although different cultures do indeed inculcate different beliefs, his stages correspond to underlying modes of reasoning, rather than to the beliefs themselves. This is the vMEMES vs memes distinction in Graves/Spiral Dynamics and answers Drew Westen‘s (1985, p151-2) allegation that, “in general, Loevinger’s model suffers from a lack of clinical grounding” and that arguably, “like Kohlberg’s theory…it confuses content and structure”. On the cross-cultural issue, interestingly John Snarey, Joseph Reimer & Lawrence Kohlberg (1985), carried out a meta-analysis of 44 studies across 26 cultures and found that people in nearly all cultures not only go through the stages in the same order – with little evidence of stage skipping – but, where they did find evidence of Stage 5 (ORANGE/green) reasoning, it was inevitably in urban areas. John Snarey & Kurt Keljo supported this with evidence in 1991 that Post-Conventional understanding occurs mainly in more developed, industrialised societies. Since, in Integrated SocioPsychology, Kohlberg’s stages are seen as the outputs of vMEMES processing moral issues, where external life conditions vary between cultures it would be expected that the rate of vMEME emergence and, therefore, moral reasoning (as an output of vMEME activity) would vary in accordance with the cultural determinants. However, far from all developmental psychologists accept emergence is hierarchical. For example, A Wahba & L Bridgewell (1976) argue there is little evidence for the ranking of needs Maslow described or even for the existence of a definite hierarchy at all. Chilean economist and philosopher Manfred Max-Neef (1992) states fundamental human needs are non-hierarchical and are ontologically universal and invariant in nature – part of the condition of being human. Poverty, Max-Neef argues, is the result of any one of these needs being frustrated, denied or unfulfilled. Stone Brown, a Native American psychologist, also argues against needs being hierarchical in her concept of ‘Native Self Actualisation’. She writes (p38) that her model is “circular as each domain of the model is given equal importance.” However, the weight of evidence that Kohlberg’s stages are experienced in the same order, regardless of culture, suggests hierarchies of needs, motivations and morality are indeed universal. Resistance to the concept of hierarchy can be considered an output of the GREEN vMEME’s drive for equality. Inevitably, though, the memes dominating in a culture will have an effect on how vMEMES process moral issues. Joan Miller, David Bersoff & Robin Harwood (1990) found that in India the moral code tended to emphasise social duties more than individual rights. This led Richard Shweder, Manamohan Mahapatra & Joan Miller (1990) to propose an alternative Post-Conventional morality in India, based on conceptions of natural law and justice, rather than individualism and social equality. However, John Berry et al (1992) found that, on the really serious moral issues, there was little difference between the Indians and the Americans in relation to social responsibilities. This symbiotic relationship between the life conditions and vMEME emergence and activity would explain why Kenneth Rubin & Kristin Trotter (1977) found different moral reasoning over several different dilemmas. Different life conditions – even theoretical ones – require different thinking! R V Burton (1976) attributes inconsistencies in moral reasoning to situational factors such as likelihood of punishment or peer group pressure – ie: life conditions. Beck (2009) has been at pains to stress the criticality of the life conditions (internal or external) to the level of complexity of thinking activated or dominating. In other words, the context will influence the vMEMES (or levels of thinking) at work. So different levels will be prominent in different contexts. Much of the research considered was, of course, carried out through questionnaires and interviews – which are vulnerable to social desirability bias and other forms of the respondent manipulating their answers. Observations are vulnerable to accusations of subjective interpretation (meta-stating) and researcher bias. John Santrock (1975) thought he had exposed weaknesses in the methodologies of these developmental researchers when he found that a child’s apparent stage of moral reasoning could not predict whether they would cheat, given the chance. In other words, verbalised responses did not match real-life choices. 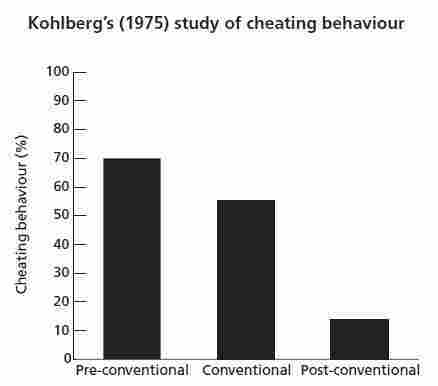 However, Kohlberg (1975) compared actual cheating behaviour amongst students at different levels of moral reasoning. Around 70% of the students at the Pre-Conventional level were found to cheat, compared with only 15% at the Post-Conventional level. Cheating students at the Conventional level were intermediate (approximately 55%). Kohlberg’s work here is supported by that of Eugene Fodor (1972) who found that delinquents tended to operate at lower stages than non-delinquents. Paradoxes abound in the way academia has viewed the work of these developmentalists whose work has yielded such similar findings. Graves and Loevinger are all but unknown outside of certain ‘Integral’ circles while Beck is often regarded more as a political consultant than a psychologist. Maslow’s Hierarchy of Needs, while increasingly not included in university Psychology courses, remains incredibly popular and considered highly useful in education, social work, mental health, business and management (William Kremer & Claudia Hammond, 2013). To demonstrate just how inconsistent academia is towards these pioneers, according to a study of the most eminent psychologists of the 20th Century by Steven Haggbloom et al, Kohlberg was the 16th most frequently cited psychologist in introductory textbooks throughout the century, as well as the 30th most eminent overall. In whatever walk of life – personal relationships, family and friends, work (public, private or voluntary sectors), politics, etc, etc – you deal with people. So how people see their circumstances and how they cope in those circumstances are critical factors affecting behaviour. The Gravesian approach enables us to understand the key driving forces underpinning people’s behaviour – the vMEMES – to identify why they do what they do when they do it. The predictive nature of the model and the insight it gives us into the needs of each vMEME enables us to develop strategies to manage change in a way that really does take into account all the needs of all the stakeholders. Beck terms the macro-application of Graves/Spiral Dynamics ‘MeshWORKS’ . Working through the lenses of 4Q/8L is usually the most effective way of constructing a MeshWORK. The most important field trial of Graves/Spiral Dynamics to date has been in South Africa where Beck used the model to assist Nelson Mandela, F W DeKlerk and other key leaders in designing the early-mid-1990s transition from Apartheid to multi-cultural democracy – see: Don Beck & South Africa. The first major use of Graves/Spiral Dynamics in the UK was the HemsMESH project, based at Hemsworth High School in Pontefract, West Yorkshire. Other notable large-scale uses of the model include work with government departments in Holland, input into redesign of the Icelandic constitution and work with representatives of the Palestinian Authority on the future of that nation. Beck has set up the Centres of Human Emergence to progress this approach. In addition to its application at a geo-political level, the Gravesian approach can be used in commerce and industry to work internally on management development and workforce culture issues and externally to understand customers better and to improve customer relations. My own case studies of applying the Gravesian approach in both a commercial company and a local authority team are available in the Services pages. The Gravesian approach helps us to identify many of the factors which contribute to problem behaviour in school classrooms. Click here to view materials I developed which were used by Beck in his keynote address to the World Education Fellowship Conference in Sun City, South Africa, in April 2001. A number of practitioners working in counselling and therapy, including myself, are using the Gravesian approach to ascertain which vMEMES have developed unhealthily so they can work out just what the individuals concerned need to break through deep psychological blockages. The Services pages include several case studies from my own work with clients. The Gravesian approach, especially when used to underpin Neurological Levels and applied through the frame of 4Q/8L, is at the core of Integrated SocioPsychology, a key aim of which is to reconcile and align the disciplines of the behavioural sciences and their competing schools – in the process drawing upon complimentary disciplines in the hard sciences (Biology, Neuroscience). If you wish to really understand what is going on when people behave in a way you don’t understand or don’t like, then you need to be aware of which vMEMES are leading them to do what. Note: The video clips of Don Beck in conversation with Doug Kruschke are from the DVD ‘Dr Don Beck, Spiral Dynamics Integral: a Challenge to Leadership’ – directed by Tom Feldman and copyright © 2006 Clearfire Media. Further information on the DVD can be obtained by emailing Tom via tom@tomfeldman.com.